Are you looking for a place where you can enjoy eating outside in company and surrounded by the wonderful scenery of Lessinia? 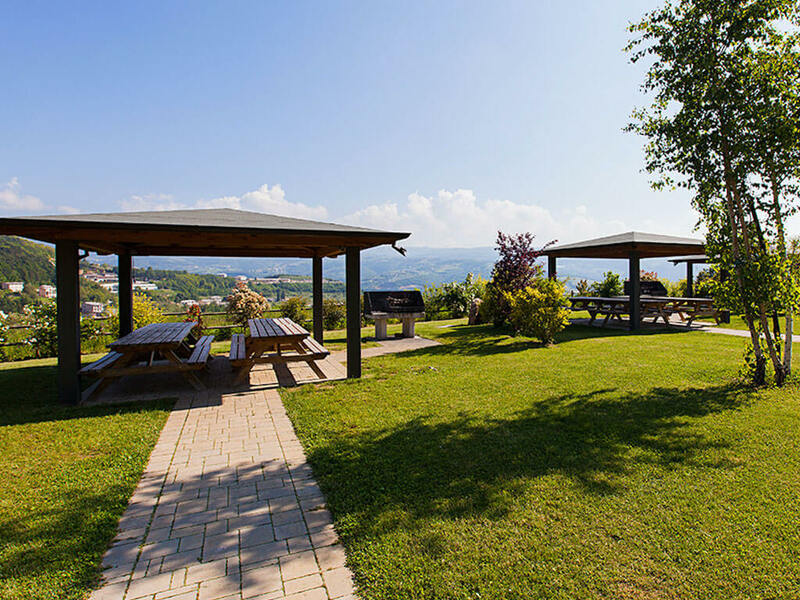 Located next to the Benedetti shop, Bosco Allegro is an extensive green area equipped with barbecues and complete with seating, shelters and gazebos, as well as a bar. It’s a peaceful spot at an altitude of 700 metres in the mountains of Lessinia, where you can relax, eat and be in touch with nature; on its paths you may meet fallow deer, Brogna sheep and donkeys. Bosco Allegro is suitable for a variety of occasions spent with friends or family: a Sunday outing, a lunch or a party. We can even help you organise a buffet for the occasion. 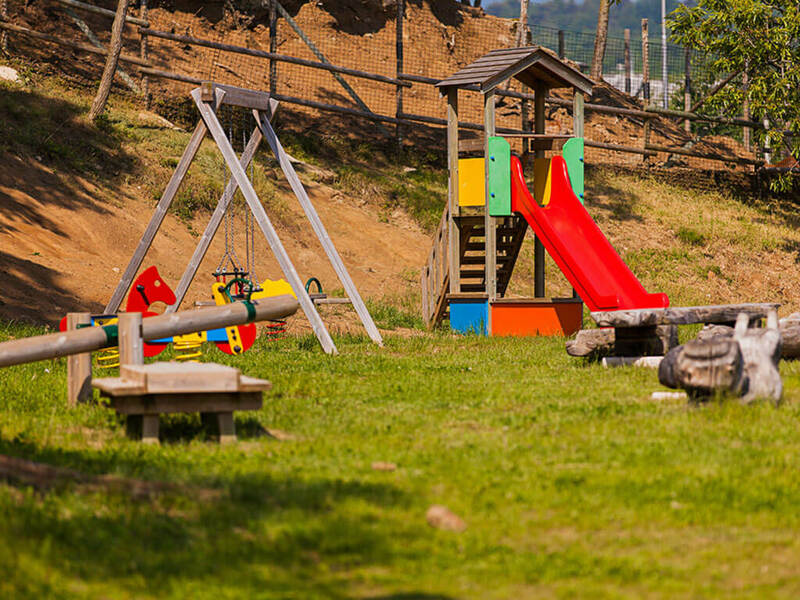 It’s ideal for the little ones too, because Bosco Allegro has a children’s play park and is completely fenced to make it safe. And of course it’s an excellent opportunity for visitors to Verona or Lake Garda to enjoy a place that combines beautiful scenery with unmistakable flavours. On Sundays and holidays the bar is available, serving ice creams, coffees, soft drinks and other delights. For camper van enthusiasts, there’s a special area next to the park. The area has electric hook-ups and water input and outlet. The park features drinking fountains for refreshment in the warm summer weather. The park provides toilets for men, women and disabled visitors. For summer nights at Bosco Allegro, the park can be lit until midnight. If you don’t feel like cooking, our barbecue chef is available. Scroll down for more information. The gazebos in the park are solid structures built in wood and steel. Each has its own lighting and electric sockets for appliances. In the park you can see several local animal species, including fallow deer, Borgna sheep and donkeys. All can be viewed on the special routes. 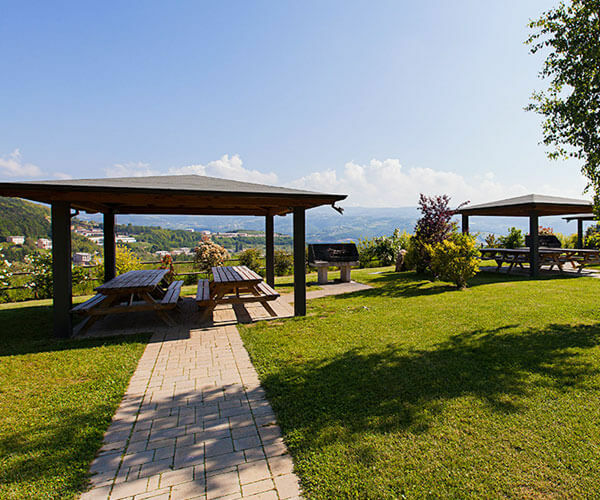 Bosco Allegro is an extensive green space created by Corrado Benedetti S.r.l. for families. It is equipped with barbecue stations and gazebos with seating. Entry includes a barbecue menu of your choice, tongs and grille for cooking. Everything else (cutlery, drinks, fruit etc) you are free to bring with you. Booking is essential. To make your booking, just complete the form we’ll send you and choose your barbecue menu. You can collect your shopping at the Corrado Benedetti shop between 9:00 and 12:00 and between 15:00 and 18:00. The park is open Tuesday to Sunday from 9:00 to 24:00. In the evenings the park can be lit until midnight. Remember to pick up your shopping at the store! The park is open every day in July and August. Gazebos are shared with other visitors. The space reserved for you depends on the number of people in your group. The fireplace is shared with the other occupants of the gazebo. You may have to wait your turn to cook. You can buy firewood and charcoal at the park. Subject to availability and booking, our barbecue chef can cook your meat for you (only products bought in the store, as stated). The cost is 60 euros for up to 30 people. An additional 2 euros per person will be added. The barbecue chef is an optional extra and is payable separately. 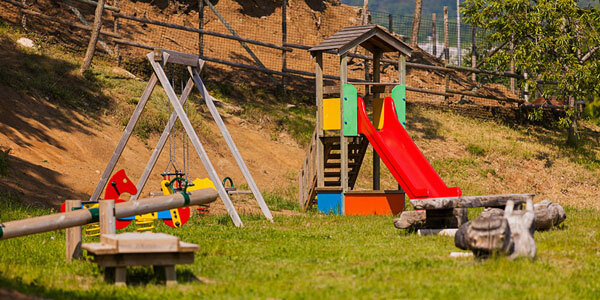 At Bosco Allegro, we have fun while respecting the environment. Games and music are allowed as long as they don’t disturb other visitors. Animals are welcome, but must be kept on a lead at all times and muzzled, depending on their breed. Corrado Benedetti Srl declines all responsibility for theft or damage to persons or objects within the park, the car park or other areas belonging to the firm.